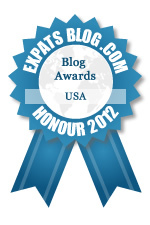 ExpatsBlog.com Expat Blog Awards 2012: USA Honourable Mention Award! A wonderful blog which shares life in the US from the perspective of a Jordanian man who is living in Missouri. I greatly enjoy the cultural posts and seeing life in my country through the eyes of another. Jaraad's blog covers a variety of topics, and is among the best! One of my favorite blogs to read! Jaraad is very talented and very thoughtful in his posts. What I love about his posts is the way he introduces living in the USA and explaining the cultural differences and similarities in a very articulate way to a degree where you can actually imagine yourself there with his posts and beautiful pictures. The posts remain in your mind once you read them! That's how good they are! My favorite posts are the one about the library and the pictures of it, the one on the lake with pictures of ducks and the post about first day of college!I really love this blog and I really hope it wins! This is an outstanding blog that provides excellent insight into Arab culture, American culture, and the cultural (mis-)understandings as the 2 meet in the USA or in the imaginations of anyone around the world. Jaraad favours genuinely open and fair dialogue, which never descends into culture bashing. I always read the posts and the comments, and often comment myself. This blog has been invaluable in itself, and a conduit for the blogs of others via their high quality comments here. I have been reading Jaraad's blog for ages and the blogger behind it is one of few cyber acquaintances that I would like to meet in real life. I love Jaraad's blog! I'm an American in Jordan, he'a a Jordanian in America, and I love the positive exchange of national superlatives. What I like best: he is not easily offended, he is a man of faith who, like Madeleine, 'smiles at the good and frowns at the bad'where it is found in both cultures, both faiths, and both genders. BRAVO! Interesting and intelligent blog with a great perspective on what it's like being Arab in the USA. One of my constant checks on the web, a great blog indeed. Opens up a lot of venues to consider + reconsider cultural differences and their relatedness from a unique well-suited perspective. Thanks Jaraad for that. Jaraad is a great blog and deserves all the best. I like the way Jarad sees US through an Arab eye. One of my favorite blogs. Jaraad's posts show me my own country in a whole new light. Smart, interesting blog. Always a pleasure to read. The American life from a Jordanian perspective. my reference for daily events, news, activities and American culture. an interestingly different perspective, he's normally bold and thorough with the topics he blogs about, for those Arabs who're interested in the American culture, and those Americans who're interested in the Arabic culture, I find his blog, in a way .. educational ..